Electrochemical behavior of different anode materials in electrolytes containing trivalent chromium salts was investigated. Some of electrodes (Ti/MnO2, platinized titanium, materials based on Ebonex®) were shown to be n-type semiconductors. Semiconducting properties of electrodes affects their electrochemical behavior.It was shown that choice of an appropriate anode for a trivalent chromium electroplating bath should be based on compromise between its selectivity and service life. It was found that current efficiency of Сr(VI)-species strongly depends on the nature of anode material. Dimensionally stable anode based on mixture of titanium oxides and ruthenium oxides, PbO2, Ti/MnO2 anodes are characterized by low rates of Cr(VI)-species generation. Nevertheless these materials are not stable in the electrolyte media that limits their application for hard chromium electrodeposition. Composite materials based on platinized titanium or platinized Ebonex® are recommend as anodes for carbamide-containing electrolytes since they characterized by good service life and admissible values of current efficiency of Сr(VI)-species. Vykhodtseva, L.N., Edigaryan, A.A., Lubnin, E.N., Polukarov, Yu.M., Safonov, V.A. Composition, Structure, and Corrosion–Electrochemical Properties of Chromium Coatings Deposited from Chromium(III) Electrolytes Containing Formic Acid and Its Derivatives. Russian Journal of Electrochemistry, 2004, vol. 40, p. 387–393. Safonova, O.V., Vykhodtseva, L.N., Polyakov, N.A., Swarbrick, J.C., Sikora, M., Glatzel, P., Safonov, V.A., Chemical Composition and Structural Transformations of Amorphous Chromium Coatings Electrodeposited from Cr(III) Electrolytes. Electrochim. Acta, 2010, vol. 56, p. 145-153. Danilov, F.I., Velichenko, A.B., Electrocatalytic Activity of Anodes in Reference to Cr(III) Oxidation Reaction. Electrochim. Acta, 1993, vol.38, p. 437-440. Kasian, O.,Luk’yanenko, T., Velichenko, A. Anodic Decomposition of Complexing Agents in Electrolytes Based on Cr(III) Salts at Composite TiOх/РtOy Electrodes. Chemistry and Chemical Technology, 2012, vol.6, no. 3, p. 241-244. Kasian, O.I., Luk’yanenko, T.V., Demchenko, P., Gladyshevskii, R.E., Amadelli, R., Velichenko, A.B., Electrochemical Properties of Thermally Treated Platinized Ebonex® with Low Content of Pt. Electrochim. Acta, 2013, vol. 109, p. 630-637. Lodi, G., Properties of conductive transition metal oxides with rutile-type structure. In. : Trasatti, S., (ed.) Electrodes of conductive metallic oxides. Part A, Amsterdam: Elsevier, 1980, 478 p.
Trasatti, S., Electrocatalysis in the Anodic Evolution of Oxygen and Chlorine. Electrochim. Acta, 1984, vol. 29, p. 1503-1512. Kasian, O.I., Luk’yanenko, T.V., Velichenko, A.B., Anodic Oxidation of Cr3+ Ions in a Chromium Electroplating Bath on Pt and Composite TiOx/PtOy. Russian Journal of Electrochemistry, 2013, vol. 49, no. 12, p. 1165-1170. Kasian, O., Luk’yanenko, T., Velichenko, A., Oxidation of Cr3+-ions at the Composite TiOx/PtOy Electrode, ECS Transactions, 2013,vol. 45, no. 9, p. 13-18. Walsh, F.C., Wills, R.G.A. The Continuing Development of Magnéli Phase Titanium Sub-oxides and Ebonex® electrodes. Electrochim. Acta, 2010, vol. 55, p. 6342-6351. Hayfield, P.C.S., Development of a New Material - Monolithic Ti4O7 Ebonex® Ceramic, 2002, Cambridge: Royal Society of Chemistry,97 p.
Kao, W.-H., Patel, P., Haberichter, S.L. Formation Enhancement of a Lead/Acid Battery Positive Plate by Barium Metaplumbate and Ebonex®. J. Electrochem. Soc., 1997, vol. 144, p. 1907-1911. Bejan, D., Guinea, E., Bunce, N.J., Mechanistic Investigation of the Conductive Ceramic Ebonex® as an Anode Material. Electrochim. Acta, 2012, vol. 69, p.275-281. Farndon, E.E., Pletcher, D., Studies of Platinized Ebonex® Electrodes. Electrochim. Acta, 1977, vol. 42, p. 1281-1285. 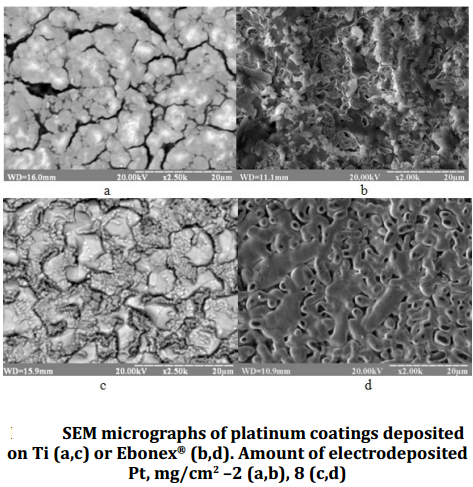 Farndon, E.E., Pletcher, D., Saraby-Reintjes, A., The Electrodeposition of Platinum onto a Conducting Ceramic Ebonex®. Electrochim. Acta, 1977, vol. 42, p. 1269-1279. Dieckmann, G.R., Langer, S.H., Comparisons of Ebonex® and Graphite Supports for Platinum and Nickel Electrocatalysts. Electrochim. Acta, 1998, vol. 44, p. 437-444. Pesty, F., Steinriick, H.-P., Madey, T.E., Thermal Stability of Pt Films on TiO2(110): Evidence for Encapsulation. Surface Science, 1995, vol. 339, p. 83-95. Matsumoto, T., Batzill, M., Hsieh, S., Koel, B.E., Fundamental Studies of Titanium Oxide–Pt(100) Interfaces I. Stable High Temperature Structures Formed by Annealing TiOx Films on Pt(100). Surface Science, 2004, vol. 572, p. 146-161. Kasian, O., Luk’yanenko, T., Velichenko, A., Amadelli, R., Electrochemical Behavior of Platinized Ebonex® Electrodes. Int. J. Electrochem. Sci., 2012, vol.7, p. 7915-7926. Velichenko, A.B., Kasian, O.I., Luk’yanenko, T.V., Amadelli, R., Demchenko, P.Yu., Gladyshevskii, R.E., Physicochemical Properties and Electrochemical Behaviorof Ebonex/Pt Based Materials. Protection of Metals and Physical Chemistry of Surfaces, 2013, vol. 49, no. 6, p. 705-711. Protsenko, V.S., Gordiienko, V.O., Danilov, F.I., Kwon, S.C., Thick Chromium Electrodeposition from Trivalent Chromium Bath Containing Carbamide and Chromic acid. Metal Finishing, 2011, vol. 109, p. 33-37. Kasian, O.I., Luk’yanenko, T.V., Velichenko, A.B., Electrochemical Properties of Heat_Treated Platinized Titanium. Protection of Metals and Physical Chemistry of Surfaces. 2013, vol. 49, no. 5, p. 559-566. Kasian, O.I., Luk’yanenko, T.V., Amadelli, R., Velichenko, A.B., Electrochemical Properties of Ebonex®/Pt Anodes. Russian Journal of Electrochemistry, 2013, vol. 49, p. 557-562. Amadelli, R., Velichenko, A.B., Lead Dioxide Electrodes for High Potential Anodic Processes. J. Serbian Chemical Society, 2001, vol. 66, p. 835-845.